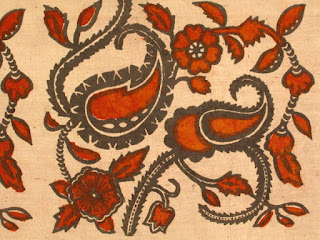 According to Tashkent art critic Shakhalil Shayakubov, hand-made printed cloth was a widespread and well-developed craft in the 11th century AD in Uzbekistan. 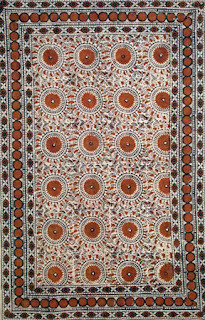 One of the main centres was at the weaving town of Chitgaron, near Bukhara, whose entire population was engaged in producing printed fabrics. Communities organized themselves around aspects of the production process: in one neighbourhood were the weavers, another group made mineral and vegetable dyes, wood carvers made intricate kalyb (blocks) to apply pattern on a cloth. All these artisans would bring their goods to the main neighbourhood where the cloth was printed by dipping the kalyb into trays of dye before being stamped by hand on the fabric. Silk Road merchants would then carry the fabrics along their route. Regrettably, with the introduction of chemical dyes and machinery, most print masters could no longer sustain a livelihood; the communities dwindled and many techniques and skills were lost. It was only in the 1970s, with the opening of an Indian shop, Ganges, in Tashkent, that Uzbeks saw that those Indian fabrics were printed using the same techniques as their forefathers. At the same time an association of artisans was established to revive the lost and forgotten secrets of folk crafts, including woodblock, known in Uzbekistan as chitgarlik. Craftsmen collected ancient looms and kalyb, studied museum exhibits, and sought out old practitioners. A young Tashkent man, Abdurakhim Rakhimov, whose great-grandfather and grandfather had been famous chitgar masters, spent several years researching ancient dyeing techniques and experimenting with natural plant materials to recreate the colours and designs of his forebears. The main dye (black) is made from metallic rust, pomegranate peel and Iranian bean seeds, to which is added apricot resin as a thickening agent. The red dye is derived from a plant ruyan with alum added. I was fortunate to see an exhibition of Mr. Rakhimov's work at the Museum of Applied Arts in Tashkent in 2005, where I purchased two beautiful tablecloths. The US Ambassador's Fund for Cultural Preservation is also contributing to the development of chitgarlik in Uzbekistan. A project in progress at the Said Ahmad Hodja Medressah Artisan Development Centre in Margilan, Ferghana Valley, is working to revive block printing and establish a natural dye workshop. By opening a natural dye lab and teaching artisans how to operate it, the project aims to promote the use of natural dyes and assist in maintaining the historical accuracy of chitgarlik. To date, using photographs and existing block collections found at museums throughout the country, project participants have recreated and restored over a hundred kalybs. Participants are conducting ongoing research to gather material for a chitgarlik reference book, which will include information about kalybs, natural dyes, dyeing methodology and proper printing techniques. It will published in English, Russian and Uzbek. Tashkent's Museum of Fine Arts and the Applied Arts Museum have splendid woodblock pieces. Nargis Bekmuhamedova in Samarkand reworks vintage woodblock fabric into beautiful coats, jackets and hats. 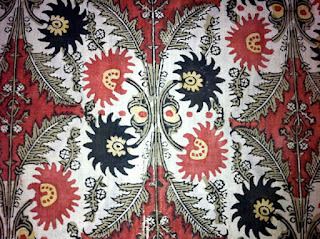 The antique shops in Bukhara are also a good place to poke around for vintage woodblock fabrics. On an Uzbek Journeys tour you will also have a chance to view the woodblock process at the workshop of a contemporary artisan in the old city of Tashkent. The 3-day Ferghana Valley excursion includes a visit to a woodblock printing studio.